If you’re someone always looking to improve your home, natural design is a trend to embrace. A good place to start is your bedroom because natural touches can improve your sleep. Using décor to get better sleep while also making your home more appealing is a win-win. Artificial and synthetic decorations and accessories can release low-level toxins in your bedroom air. They can also be visually disruptive which isn’t ideal for sleep. Finally, all the tech we embrace to make our lives more convenient gives off blue-light which is a sleep killer. By making your bedroom more natural, you can improve your health and sleep. These five natural design elements are ones to consider. The most cost-effective and healthiest element for better sleep is sunlight. Exposing yourself to sunshine for 30 minutes daily help you fall asleep faster at night. Balance light and dark appropriately with design. You’ll sleep more deeply in total darkness so accessorize with room-darkening window treatments if you have light pollution at night. If you don’t, leave drapes open so morning sun can wake you. Fresh air is a critical natural design element. Plants take in the CO2 we exhale and convert it to healthful, healing oxygen. Plants on your bedside table make sure you have clean air that helps you sleep better. Quiet at night is best for sleep and you can combat street noise by decorating with windowsill plants since they absorb sound. Finally, plants like Valerian and Jasmine can help you fall asleep faster. Avoid synthetics everywhere in your bedroom for more natural sleep. Organic bamboo, cotton, and linen sheets are cooling and comfortable. Natural wool blankets are ideal because they cool in summer and warm you in winter. 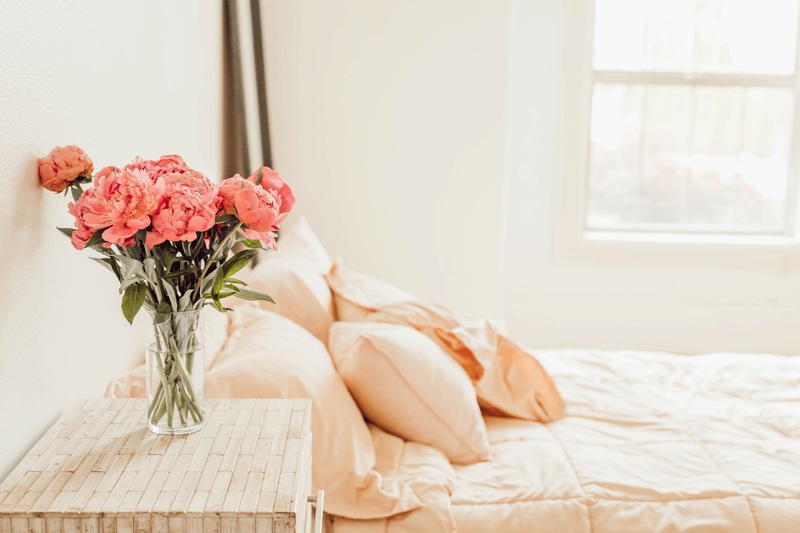 In your décor, opt for textiles that are natural, undyed or dyed with natural dyes, and certified organic for healthiest sleep while achieving a flawless style for curtains, sheets, and blankets. Eco-friendly wood furnishings from sustainable sources are guilt-free and healthy décor. Natural wood is visually soothing which promotes sleep and doesn’t give off heavy chemical smells which can disrupt your dozing. Also, consider streamlining your room by eliminating clutter and unneeded pieces. A bed with a good quality mattress, side tables, and a dresser are all you probably need. One design element not to neglect when using natural design for better sleep is your walls. Avoid bright colors because these stimulate the brain and can keep you awake. Go for soothing neutrals and always choose low-VOC paints that won’t expose you to fumes. Look for organic wall paint with zero VOCs for optimal health, sleep, and an eco-friendly bedroom. Achieving optimal sleep, both in quality and quantity of rest, is critical to your health and quality of life. Consider going all-natural with design elements in your master bedroom and children’s rooms since sleep is vital to everyone. Some natural design elements are easier than others to implement. You can get started on making your bedroom a healthy sleep sanctuary today.